Diplomats are supposed to be tactful peacemakers. As emissaries of their home country in a foreign nation, they act as dignified officials who preserve the countries’ relationships in the best possible way. This role means that when they’re posted in a country, they have certain legal powers normal people can only dream about. The most famous of these is diplomatic immunity … and sadly, quite a few diplomats abuse this privilege to commit crimes. Shuji Shimokoji is a long-term Japanese diplomat who has served his country since 1970. In 1999, he was Japan’s consul general in Vancouver, when Canadian officials discovered that his private behavior was less than diplomatic. They arrested Shimokoji for assaulting his wife during an argument. The diplomat had bruised his wife’s face and arms with his fists, and when questioned about his behavior, he insisted that wife-beating “was a cultural thing and not a big deal.” Canada disagreed and charged Shimokoji with assault. The diplomat entered a guilty plea, but thanks to his immunity, he was given an absolute discharge: No criminal record, no jail time served. That’s not to say he got away entirely without consequences, though. The Japanese officials were not exactly amused by Shimokoji’s comments about cultural wife-beating, and their Foreign Ministry ordered him to return home. However, the crime did little to derail Shinokoji’s career in diplomacy. After some apologies, he went on to serve as a minister in Japan’s embassy in the US. He later served as his country’s ambassador to various countries, including Panama and Venezuela. Diplomatic immunity is not necessarily limited to old men in suits. Almost anyone with the right credentials can have one, even soldiers. One of the strangest ways a soldier has ever claimed immunity happened in 2004, when Marine Staff Sergeant Cristopher VanGoethem killed a famous Romanian rock star … and immediately left the country under diplomatic immunity. VanGoethem was working as a guard at the US embassy in Bucharest, when he ignored a stop sign and the SUV he was driving rammed into a taxi. The passenger of said taxi happened to be Teo Peter, a beloved Romanian rock star. Peter was killed in the crash, and a breath test by the local police showed that VanGoethem had been drinking. Before he could be arrested, the embassy officials intervened, and an embassy official escorted VanGoethem safely out of the country. Although the Romanian officials protested this, the US insisted that they would carry out their own investigations. In 2006, a US court martial found VanGoethem not guilty of negligent homicide. They did, however, find him guilty of some lesser charges, such as obstruction of justice and making false statements. A tenant with a steady, well-paying job seems like a dream for most landlords, but when the job in question gives the tenant diplomatic immunity, things can get a lot more difficult. If a diplomat decides to stop paying rent, there’s very little a landlord can do to persuade them. Diplomatic immunity makes them summons-proof, and you can’t even evict them. Sure, a landlord could try to make them sign a document that makes them waive their immunity for rent-related purposes, but even that is destined to fail: Diplomats can sign any document they want but they can’t legally stop being diplomatically immune if their country doesn’t officially strip the privilege from them. This is a particularly big problem in New York, where the City Administrative Code prevents discrimination based on employment. This is normally an excellent thing, but in the context of diplomats who don’t want to pay rent, it’s a minefield — especially since the city has the highest concentration of people with diplomatic immunity in the whole country. As a result, some countries’ missions and embassies have racked up tens of thousands of dollars in unpaid rent, and have no intention to pay. In 2017, Los Angeles witnessed a real life version of Grand Theft Auto V, when a yellow Ferrari and a white Porsche raced through the streets of Beverly Hills, ignoring traffic signs and recklessly zooming through residential areas. The race finally ended when the Ferrari pulled to a stop on a driveway in a rich area, its engine smoking. The police immediately realized that this would be a difficult investigation. Although the drivers’ faces weren’t clearly visible in the surveillance footage, the cars were connected to Sheik Khalid Hamad Al-Thani, a rich motorsports enthusiast who may or may not be part of the Qatar royal family. At least one of the vehicles wasn’t registered to be brought into the US. And to make things even more complicated, when the Sheikh was contacted about the incident, he immediately invoked diplomatic immunity. What makes this case particularly strange is that the police were suspicious about the Sheikh actually having any diplomatic protection. However, they were unable to do anything about it, because when they were still considering the charges, the Sheikh and his cars both disappeared from the country. The Beverly Hills authorities said that they’d look into charging the people involved with reckless driving, and possibly with false claims of diplomatic immunity. However, it looks like no progress on the case has been made, so we’re guessing their efforts haven’t been exactly productive. A little known fact about diplomats is that when they’re operating at the highest level of immunity, they’re so untouchable that they can even freely traffic humans. Some diplomats happily abuse this ability by importing personal servants and domestic workers from their home countries, then confiscating their passports and keeping them around at slave wage. A 2008 Government Accountability Office investigation found 42 such workers in the US, but their true numbers are thought to be much higher. This is because the trafficked workers often live in fear of their “employers,” who keep them in restricted conditions and hold considerable power over them. According to the organizations and investigating bodies keeping track of the situation, this is a problem most countries are at least somewhat aware of, but choose to carefully smooth over. Despite the fact that some of these workers are forced to work over 90 hours a week without breaks, rest or sometimes even food, the problem has persisted for decades. The extremely few diplomats who have ended up in hot water because of their human trafficking have been relatively low-ranking ones who handled the job so badly that the country had no choice but to react. In a famous case from 2014, an Indian consular official named Devyani Khobragade was indicted on charges of visa fraud and false statements because she tried to obtain a visa for a domestic worker who wasn’t paid even the minimum wage. Even then, India tried to claim that Khobragade had full diplomatic immunity. When it turned out that she didn’t have one, they tried to get her one. Despite all this, it took enormous public pressure for the United States to deny the change in Khobragade’s assignment and indict her. Life is pretty weird and horrifying for almost everyone living in North Korea. Still, things don’t necessarily get any better if you manage to land yourself a cozy diplomat gig and leave the country behind, even if it’s just temporarily. First of all, regardless of where you’re posted, you’re not going to be paid much more than you would in Pyongyang, which forces North Korean diplomats in expensive cities like London to shop in thrift stores. Since the country’s leadership also requires its embassies to be “self-sufficient,” the embassy staff is struggling to pay the bills or even buy food. This poverty has caused North Korean diplomats to take up all sorts of criminal side hustles, with varying levels of success. In 1976, their embassy in Denmark asked to import 2.5 million cigarettes “for personal consumption.” When this pretty obvious attempt at smuggling was denied, two of the embassy’s diplomats were arrested because their cars were stuffed with half a ton of marijuana. Meanwhile, in Norway, the ambassador and his team were caught with 4,000 smuggled bottles of liquor and 140,000 cigarettes. And the list goes on. Between 1984 and 2004 alone, there were over 50 documented arrests of North Korean diplomats. Many of them were selling possibly state-produced crystal meth, and some experts believe that state-sanctioned drug trade might be pretty much an official part of the North Korean diplomat’s job. Investigators often attempt to lure child predators by posing as underage kids online. In 2005, one sheriff’s deputy from Bedford County, Virginia caught a particularly big fish this way. Posing as a 13-year-old girl, he was soon targeted by a creepy guy who solicited a meeting with “her” at the local shopping mall. When the meeting took place and the sheriff’s men moved to arrest the man, they were in for an unexpected discovery: The child predator in question was Salem Al-Mazrooei, a diplomat working for the United Arab Emirates. Al-Mazrooei immediately requested diplomatic immunity, and the Bedford County officials were forced to release him after confirming his identity. However, a particularly tenacious Commonwealth Attorney named Randy Krantz wasn’t satisfied with the outcome, and started a quest to prosecute Al-Mazrooei and get his immunity waived. Unfortunately, the UAE embassy was less than welcoming: While Krantz was under the impression they were reviewing the case, the embassy appears to have prepared for Al-Mazrooei’s quiet removal from the country. Still, although the US officials didn’t get to prosecute the man, they at least made sure that he isn’t welcome in the country: the State Department made sure that he could not enter US soil unless it was to answer the charges that are waiting for him in Virginia. Berlin, 2017. A man casually opened the door of his Porsche without checking whether the path is clear. This resulted in tragedy, as the door opened directly in the path of a cyclist, who didn’t have the time to brake or swerve. He died on his way to the hospital. Normally, this would have led to an investigation and possible negligent manslaughter charges. However, in this case, the driver was a Saudi diplomat with immunity, and the police had no choice but to let him go. Hundreds of cyclists protested the case, as did the victim’s widow. The German officials sent a verbal note to the Saudi embassy, but while the embassy did offer a heartfelt apology over the death, it became apparent that they were far more likely to quietly withdraw the driver from the country than they were to waive his diplomatic immunity. Still, at least some good came out of this particular tragedy: The public started paying attention to the massive number of traffic violations by diplomats stationed in Berlin: there were 22,880 offenses in 2016 alone. 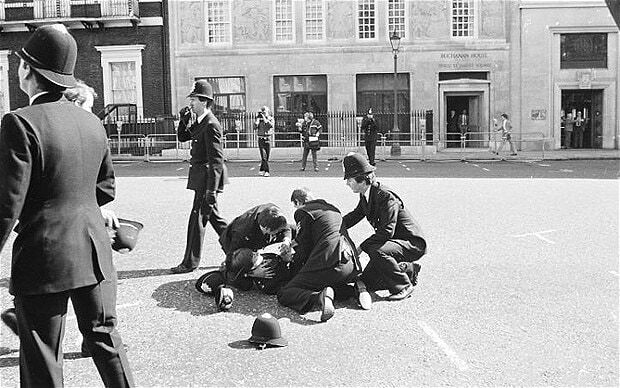 On April 17, 1984, an anti-Gaddafi demonstration took place in front of the Libyan embassy in London. Out of the blue, someone from inside the embassy opened fire at the demonstrators. The bullets injured 10 protesters. One of them also fatally hit police constable Yvonne Fletcher, who was present at the scene. The incident started a massive diplomatic incident. The London Metropolitan police sieged the Libyan embassy for 11 days, and the UK ultimately cut diplomatic ties with Libya. Still, PC Fletcher’s killer was never found. When Gaddafi’s rule ended during Libya’s 2011 revolution, the British hoped that they could send investigators in the country to get to the bottom of the case. This turned out to be a hopeless effort, and it seemed that Fletcher’s murder would remain unsolved. The investigators made some progress when a former minister of the Gaddafi regime seeked political asylum in Britain and was arrested on suspicion of being involved with the case. Still, it’s unknown if this particular man had a role in Fletcher’s death, because in 2017, the police said that they’re dropping the murder enquiry. That’s not to say that they don’t know the identity of the people involved in the death — they’re actually pretty sure that they do. The problem is that they can’t show any of their evidence in court because of national security issues. Like we mentioned earlier, the whole point of diplomats is that they preserve the peaceful relationship between countries. In 2011, Raymond Davis almost managed to do the exact opposite by single-handedly destroying the relationships of the United States and Pakistan. In a busy intersection in Lahore, Davis shot and killed two Pakistani men who approached his car on a motorcycle, with guns in their hands. The way he did it was straight out of the handbook of a spy movie villain: He peppered the men with bullets through the windshield of his vehicle, then got out of the car and finished the man who was trying to flee with several bullets in his back. The spy vibe didn’t end there: After the killings, Davis radioed the American Consulate, and soon, a wildly driving SUV arrived to pick him up, driving in the wrong direction of a one-way street. This didn’t go well, as the car hit and killed a motorcyclist before picking up Davis, and escaped the scene. Davis was caught red-handed and arrested. While searching the scene, the police found bullets, a mask, some cloth with an American flag on it, and a camera that contained secretly taken photos of Pakistani military locations. This confirmed everyone’s suspicions that Davis was a CIA operative spying on the country, and he was hauled away to prison. The case caused a massive anti-American sentiment in Pakistan, and it didn’t exactly help that the US government invoked diplomatic immunity: Even President Obama publicly called for Davis to be released. Pakistan would not be budged. Noting that the diplomatic immunity of Davis wasn’t quite as airtight as the President made it seem, and angry that the CIA refused to acknowledge the man as one of their own, Pakistan took Davis to court. This did not go particularly well for them, as Davis was soon acquitted after the families of the deceased received mysterious monetary compensation that enabled Davis’ release under Sharia law, where the relatives of the victim can pardon the killer. In the end, Davis got away with whatever it is he had been doing. Still, the whole incident was massively damaging to the relationship between the US and Pakistan, especially on the Pakistani side. Even after Seal Team Six entered Pakistani soil to take down Osama Bin Laden a few months later, the Davis case was still the one Pakistanis were more angry about. Has just been revoked revoked….